Adding some extra features in the right click menu is a good practice to ease your work and save the time. You can add several items like Command prompt, Copy the contents to clipboard, CopyTo, MoveTo in your right click context menu in Windows7. These additions obviously will benefit you by saving your time. Let’s discuss about the methods one by one. All the methods described in this article are based on registry editing. So back up your registry before editing and keep yourself on the safe side. When you work in Command Prompt, many time you need to change the directory and generally you use the command “cd directory path”. If the file is in the deep of your hard disk then repeating the task to change any directory is quite boring. You can add an entry in the right click menu by which you can open the command prompt directly in the folder, just right clicking on it. Here is the simple registry tweak. Press Windows key + R. Type “regedit” to open the registry. Navigate to HKEY_CLASSES_ROOT\Directory\shell in the registry editor. 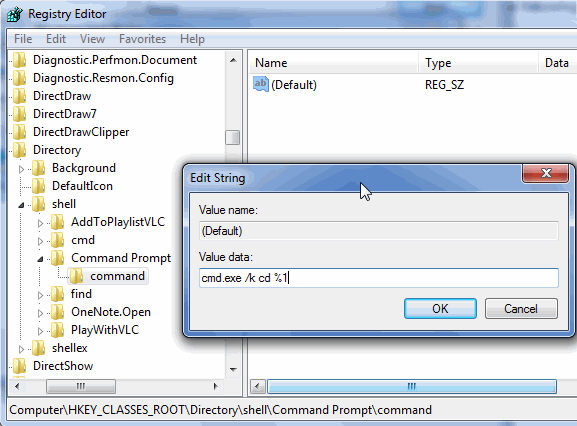 Create a new key under “shell” and name it “Command Prompt”. In the right pane modify the value of “Default” by right clicking on it and then “Modify“. In the “Value data” field write “Command Prompt here”. 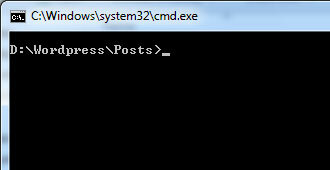 Similarly create another new key under the key “Command Prompt’ and name it as “command“. Select the new key you’ve just created and modify “Default” similarly and put the following code in the “Value data” field. Now close your registry editor and right click on any folder. You should see the “Command Prompt here” option. After choosing the option the command prompt will appear with the file path pointing to that folder. You Can read another method of doing this on Add Command Prompt to right click menu in Windows Explorer Which I wrote and tested on windows XP. The digital guitar that Google put up on his home page, to celebrate the 96th birthday of the country and jazz guitarist, songwriter and inventor Les Paul, will stay on for another day, Google informed in a Twitter post. Since Google said it is extending the doodle for US users only, users outside the US can continue to strum the Google Doodle guitar, by clicking on the “Go to Google.com” link on the country-specific Google pages. 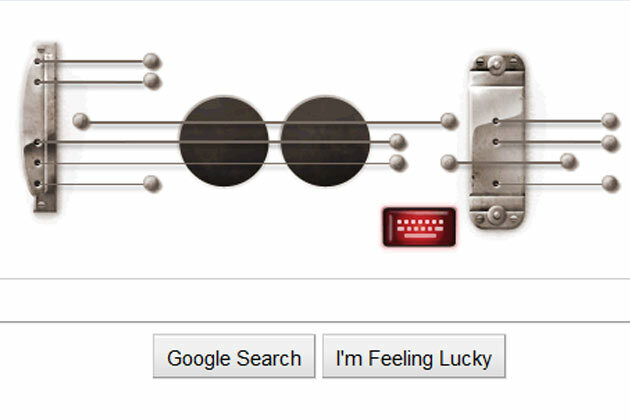 Due to popular demand, we’re leaving the Les Paul doodle up in the US for an extra day. Thanks for jamming with us!,” a post on the official Google Twitter account said. The Google doodle in honour of Les Paul is playable by hovering the cursor over the doodle and even by the computer keyboard. Users could also record the their own 30-second track. Google has now become more frequent with animated and interactive doodles. Of the last 10 Google doodles, five included animations or were interactive. The Google doodle had first gone interactive in May 2010 to celebrate the 30th birthday of the popular Pac-Man game. For a dozen years, Google has been occasionally swapping its everyday logo for a doodle. The Google doodles, an artistic take on the Google logo, have gained immense popularity over the past few years and the Google doodle team has put out commemorative doodles on numerous events of international or national importance, ranging from news events, civic milestones, birthdays, death anniversaries and important dates in history. Google estimates it has created more than 900 doodles since 1998, with 270 of them running in 2010. Some appear globally, and others are tailored for local markets. This is the best Poem which I read ever. 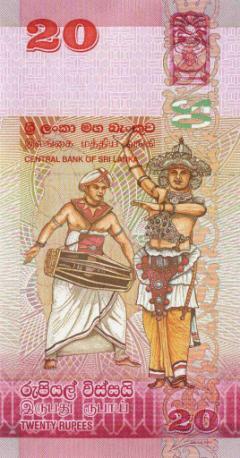 Sri Lanka’s banking watchdog- Central Bank of Sri Lanka (CBSL) is to release the twelfth Series of Sri Lankan Currency Notes including the brand new Rs. 5,000 note, next month. This means that the value of current highest denomination will be increased by 250 percent to Rs. 5,000. 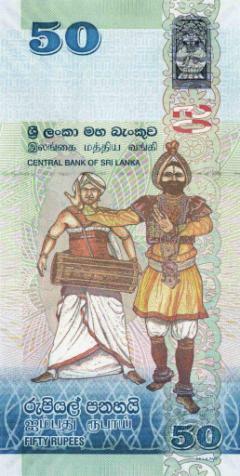 The new series is designed under a theme of development and prosperity and feature enhanced security measures, and will be available for circulation from February 2011, the Central Bank officials said at the launch of its Roadmap for 2011. “We want to stress that the printing of the new Rs.5,000 note is not a sign that inflation will go up,” Deputy Governor Dharma Dheerasinghe told reporters. Rs.2,000 note which was the latest introduced by the CBSL on October 17, 2006 while the Rs.5000 multi colour coin which was the latest coin to be launched in view of the Central Bank’s 60th anniversary. This heritage series currency note are introduced in view of the shift in demand for high denomination currency notes coupled with changes in price levels and increase in per capita GDP in the country in recent times. Central Bank justifying its action said that money circulation had increased by nearly Rs.50 billion after the end of war as a result of the surge of cash-based transactions in the island’s North and East. Despite a booming economy country’s inflation shot up to 7 percent from a 3.1 percent recorded in February 2010, surpassing Central Bank Governor Ajith Nivard Cabraal’s earlier inflation forecast of between 5 to 6 percent. 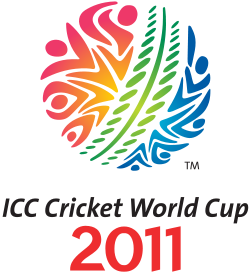 Sri Lanka will co-host the 2011 Cricket World cup along with India and Bangladesh. Sri Lanka Cricket (the country’s Cricket board) has suggested that matches will be played at Colombo’s Premadasa Stadium as well as two new stadiums in Hambantota and Pallekelle. With ICC Cricket World Cup 2011 coming in the year 2011, the game would rise to new levels. If you are a Cricket fan searching for ICC Cricket World Cup 2011 schedule, Cricket World Cup 2011 fixtures, Cricket World Cup 2011 venue and Cricket World Cup 2011 teams, then you need not to go elsewhere as you will get information on Ajith’s Blog, Cricket World Cup 2011 venue and Cricket World Cup 2011 teams and ICC Cricket World Cup 2011 schedule and every other info about ICC Cricket World Cup 2011. Once you bookmark this page you can view ICC Cricket World Cup 2011 schedule and Cricket World Cup 2011 fixtures anytime you like. Cricket World Cup 2011 venue: With India as the main host of ICC Cricket World Cup 2011, Cricket World Cup 2011 venue includes stadiums of cities like Dhaka, Mumbai, Kolkata, Mohali, Colombo, Chennai, Nagpur, Ahmedabad, chittagong and Bangalore. Cricket World Cup 2011 venue also includes new venues like Pallekelle and Hambantota – both being in Sri Lanka. Group B – India, South Africa, England, Bangladesh, West Indies, Netherlands and Ireland. Demonstrations are planned in the capitals of Spain, the Netherlands, Colombia, Argentina, Mexico and Peru to demand Assange’s release, the re-establishment of the WikiLeaks domain name and the restoration of Visa and Mastercard credit services to allow supporters to donate money to the whistleblowing site. 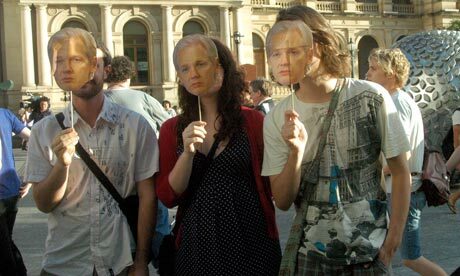 A statement on the Spanish-language website Free WikiLeaks said: “We seek the liberation of Julian Assange in United Kingdom territory.” The website called on protesters to gather at 6pm (17.00 GMT) in Madrid, Barcelona, Valencia and Seville and three other Spanish cities. It also calls for “the re-establishment of the WikiLeaks (wikileaks.org) internet domain,” and the restoration of Visa and MasterCard credit card services to enable the “freedom to move money” because no one has “proved Assange’s guilt”, nor charged WikiLeaks with any crime. Assange is in Wandsworth prison in south London after being refused bail on Tuesday. Sweden is seeking his extradition over allegations of sexual assault. His lawyers said yesterday they were preparing for a possible indictment by the US authorities. Jennifer Robinson said her team had heard from “several different US lawyers rumours that an indictment was on its way or had happened already, but we don’t know”. According to some reports, Washington is seeking to prosecute Assange under the 1917 act, which was used unsuccessfully to try to gag the New York Times when it published the Pentagon Papers in the 1970s. However, despite escalating rhetoric over the past fortnight, no charges have yet been lodged, and government sources say they are unaware any such move is being prepared. Robinson said Assange’s team did not believe the US had grounds to prosecute him but understood that Washington was “looking closely at other charges, such as computer charges, so we have one eye on it”. Earlier this week, the US attorney general, Eric Holder, said the US had been put at risk by the flood of confidential diplomatic documents released by WikiLeaks and he authorised a criminal investigation. What is Google Spreadsheets Integration? Google Spreadsheets Integration allows responses from your form to be inserted into a spreadsheet in your Google Docs account. Use the instructions below to integrate a Google spreadsheet with a nice web form. Only a google account required. If you don’t have one, just visit to create a new google account and create a new one. •Visit docs.google.com and click the “Get Started” button. •Provide Google with the information they request to create your account. •Follow Google’s instructions to complete your account setup. •Click on the “Create New” on the left hand side of the window and then there will be a drop down displaying options to create. •They it will prompt a new window with options to create a new form. •There are options to create any questions to your form. There are only 2 sample questions on your form for default. There is an option to add new items to the form. It can be used to add new form items to the form. •At the end you can save the form and the link to view the published form will be appeared bottom of the page. •And also you can edit the confirmation which the final user will get once he/she finish the submitting using “More actions” button at the top right corner. Once Google Spreadsheets Integration has been completed, your form is ready to accept results. 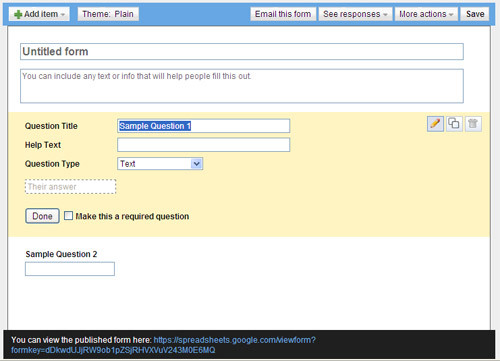 When a user fills out your form, their responses will be inserted into the specified Google Docs spreadsheet. Spreadsheet to store the data will be created automatically when you create a form. Finally you’ll see a nice form like below one. Congratulations!!! You have created your google form successfully. Enjoy it and please make a comment before you leave.